Let your food be your medicine was the sage advice of the great healer Hippocrates; he's the father of chiropractic too, avidly recommending and using manipulation. Sadly it's ignored by many with iatrogenic, or doctor caused disease, being today the third most common reason to bring on death after cardiovascular illness and cancer. Most of it is related to medication, and even supplements. 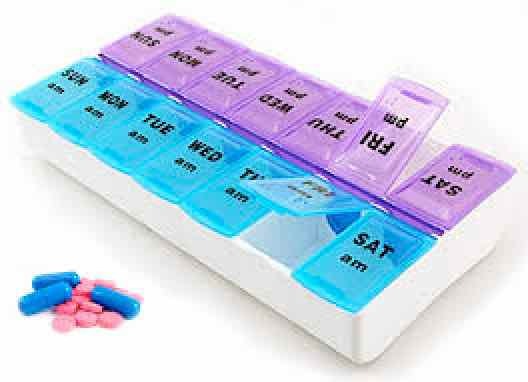 Recently, on a soaring vacation with 15 friends, I was astonished how many pill boxes were displayed at meal times; only one pilot was older than me. I'm not the gloating sort, so I never said a word, but how glad I was that I had discovered many years ago at chiropractic college to let food be my medicine. In fact it was my wife who first introduced me to the concept; at a wives' auxiliary meeting she began to learn about the importance of healthy food. Since a child I had suffered from a serious constipation problem; memories of the enema still haunt me. Imagine my astonishment that the addition of a daily prunes for breakfast, a green salad for lunch, and beets on a regular basis for dinner totally cured me of the ailment. So, in my determination never to need a 7 day pill box dispenser, I decided to outline a simple breakfast menu so that you too could let your food be your medicine. It's at breakfast, research shows, that we get many of the important nutrients that prevent heart ailments, cancer and Alzheimer's disease. You are less likely to be overweight, will suffer from less anxiety and children in particular perform better at school. There are two provisos; one is how it's grown and the other what the food manufacturers have done to ruin it; a loaf of bread baked in your own kitchen using 100 percent wholemeal is a quite different kettle of fish from that purchased from the supermarket. Obviously there is huge room for variation, but there are some basic principles that should be inviolate. Note also that by following breakfasts like these, you can totally dispense with the word diet from your vocabulary; enjoy them and you will never have a weight problem, no matter the state of your thyroid or any other organ for that matter. Diets don't work anyway; forget the term. Research shows that a shocking 95 percent of folk have put it all back on within a year, and many are heavier than ever. Go on a diet and you'll just get depressed; let your food be your medicine and you'll be free from them for ever; dinkum. So, what are these principles? Your breakfast should be high in fibre. It must contain as many colours as possible; I shoot for a minimum of three and often enjoy five or even more. It should be high in complex carbohydrates. It should contain some protein and the healthy fats. High in fibre means that there should be fruit, perhaps some greens, unrefined oats or wheat products and maybe some nuts and seeds. Many colours are most easily obtained from several different fruits. Complex carbohydrates with a low glycemic index would suggest a whole grain, unsweetened muesli or unprocessed porridge. Healthy fat is one of the controversial areas; margarines containing trans isomers are definitely taboo, so I shoot for a small amount of butter. Butter is back after all; so are eggs. Neither should ever have been banned. Protein is most easily obtained from eggs, unsweetened yoghurts high in probiotics, but alas all red meat and especially bacon is reserved for high and holy days; processed hams for example are proven beyond doubt to cause malignancies. Breast cancer and prevention is for every woman. So, if you are going to let your food be your medicine, what might your breakfasts look like, if you're to avoid the 7 day pill box dispenser? There's plenty of room for variation. For liquid I recommend freshly squeezed orange juice, absolutely no OJ, unsweetened green tea or filter coffee; at the beginning of the meal, and not too hot. A hiatus hernia is not uncommon; fluids after the meal will cause heartburn; close to boiling liquids cause throat cancer. Researchers following a large group of people over 20 years found that those eating 7 to 8 coloured foods every day had a 35 percent lower all cause of death; that's massive; aim for three or four at breakfast every morning. Your Monday breakfast might look like this if you are to let your food be your medicine. 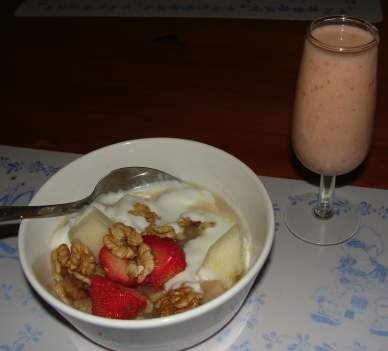 Smoothie with as many fruits as possible; include some unsweetened yoghurt. Whole grain unsweetened muesli with nuts and raisins. 100% whole grain toast, smidgen of butter and marmalade. Whilst you could repeat Monday's breakfast every day, I recommend as varied a diet as possible; that's the only way to get many of the phytochemicals our bodies need; apologies for including the words let your food be your medicine in every paragraph; it's over the top but Google demands it for the page to be rated. It's one of the reasons why Chiropractic Help is rated in the top 0.4% of 70 million active websites, but it makes the web boringly repetitive. Cup of filtered coffee, not overly hot; no sugar or artificial sweetener. 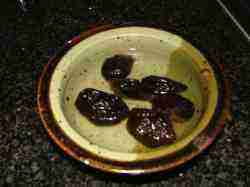 A few prunes soaked in boiling water, with a couple tablespoons of unsweetened yoghurt. 3-4 TBSP of rolled oats cooked porridge with a little butter and raw honey; milk and yoghurt are options. 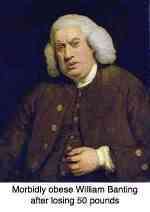 Quaker oats recipes. A couple slices of cheese on toasted low GI bread; a little butter. Research shows by the way that you can get quick constipation relief much faster and cheaper from stewed prunes that the standard medical treatment. On Wednesday we'll have an egg; it's now allowed, actually encouraged by the heart foundation because of the choline; that's a very important vitamin in the demethylation of highly inflammatory homocysteine; it's also the best source of vitamin B12. Are you up on choline food sources? Glass of freshly squeezed orange juice; mixed citrus would be better still; perhaps half a grapefruit or mandarin; make sure you include the pulp. Orange juice bioflavonoids are a must. Eggs Florentine on our toasted Panera bread menu recipe; I always toss in a some onion, garlic and tomato for the prostate gland. Apple on the way to work? There's plenty of research proving that an apple a day is no old wives' tale. Apple diet should be several times a week. On Thursday we'll have fried mushrooms; they are an exceptional source of selenium, a very important antioxidant in the prevention of the highly malignant cancers. Prostate gland health should be in the mind of every cook; it's so simple. Cup of unsweetened tea, with or without milk; preferably green tea, though I confess I drink it only under duress; it's good for us. Your favourite fruit and yoghurt; perhaps strawberries or blueberries; mulberries are one of my favourites in Spring; no sugar, of course. 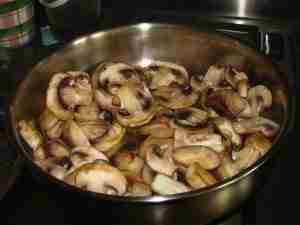 Fried mushrooms, perhaps on toasted wholewheat sourdough bread; that's my favourite. You'll notice that none of this takes long to prepare; slow food, made fast is our philosophy. But even when it does take a little longer, spend the time if you want to embrace the let your food be your medicine philosophy. You'll be spending ten times a much consulting doctors and buying medicines in any case. Can you imagine the joy of taking virtually no drugs at all? On Friday we'll revert to cereals; whole grain and unsweetened, of course; muesli or porridge, take your pick. Sorghum incidentally is one of my favourites if you can find the unrefined grain with all the fibre, vitamins and minerals; if your bring these whole grains to the boil the night before and simmer for a few minutes, perhaps putting in a 'hot box', then they don't take long to cook in the morning. The spinach in eggs Florentine is rich in lutein, the phytochemical that prevents age onset macular degeration, the primary cause of blindness in the elderly; it's all so preventable; kale is even better. Let your food be your medicine; got the message? The lutein macular degeneration link is a subject every one of us should know about. Ten million Americans are needlessly blind, and many more partially sighted. Cup of filter coffee with no sugar or sweet and low; train your tongue; it takes only a few days; I know because I've been down that road. The artificial sweetener side effects are even worse than those of sugar; chemicals in food are positively dangerous. Wholegrain, unrefined sorghum, corn or oats porridge; with all that fibre you can add a little butter and raw honey utterly without guilt; even a tablespoon of cream. 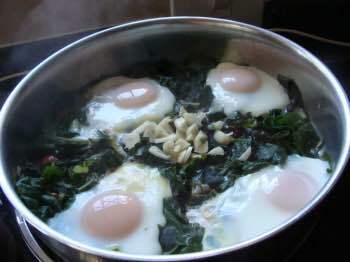 Eggs Florentine with spinach and kale, if your can find it; perhaps consider these kale benefits from your own garden; it's so easy. Throw in a tomato to the eight colors eggs Florentine, or have a bunch of grapes on the way to work; there are your colours. Remember, 35% lower all cause of death. Let your food be your medicine; boringly repetitive, but perhaps the penny will drop! On Saturday you've got a little extra time to commit to your new found goal in life; "let your food be your medicine, and let your medicine be your food," said Hippocrates. He too knew the importance of repetition. Perhaps a big fruit salad with all your favourites; I'm a fan of enjoying what's in season, rather than what's imported from distant lands. 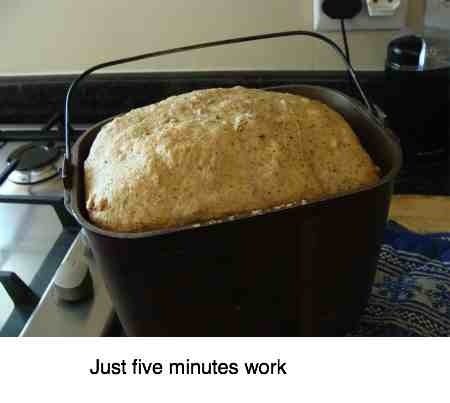 And you've definitely got time to make that easy sourdough bread recipe; it takes only five minutes after all. Remember the buzzword? Slow food made fast. Cup of filter coffee; perhaps a slow second. Always before the meal if you have any problems with heartburn. A large bowl of fruit salad and cream. 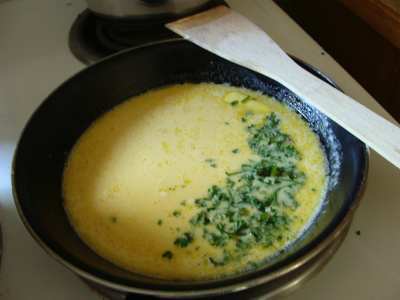 Scrambled eggs sprinkled with parsley benefits. On low GI toast you need have no anxiety about carbs; butter not margarine of course. An extra slice of toast and marmalade? You've earned it. If you've followed a routine like I've recommended in your newfound zest for letting your food be your medicine routine, then on Sunday you can have the day off and enjoy your favourites; just not bagels; they are the height of junk food. Sweetening our food with simple carbohydrates like sugar, or worse saccharine will undermine your determination to let your food be your medicine. They raise your blood glucose rapidly causing an insulin surge, and the chemicals are even worse as a cause of metabolic syndrome. Your tongue will have to be retrained, and it certainly can be done; it may mean getting away from tea bags and instant coffee; they taste awful without sugar. You will have to ring in some changes if you want to avoid the pill box dispenser; dealing with that sweet tooth may be the most difficult. Raw honey, if you can find it, in moderation is the best alternative. I alluded above that my first encounter with let your food be your medicine was the total cure of my constipation. This beetroot constipation page makes a great start. If you are going to enjoy them regularly then I strongly endorse the modern pressure cooker; solar power means you can use them for free. They reduce the cooking time by two thirds. Constipation is the cause of many serious bowel diseases; a soft, easy to pass stool is the blessing enjoyed by those who let their food be the medicine; thank you Hippocrates; you were a star who left an indelible mark on this world. Does this let your food be your medicine page make you feel intimidated? You couldn't possibly do all this! Don't feel alone; I felt that way in the beginning of my own journey of the synergy of green living. It's a step by step process. First perhaps you might start by making a smoothie from fresh fruit several times a week for the whole family. Once you've got that down, you might start hunting for a source of genuine raw honey. Then whole rolled oats, not the refined stuff. Can you believe it that making our own low GI bread using unrefined 100% wholemeal takes me only five minutes every morning? Then you don't need to buy vitamin E tablets and bran any more. It requires just three minutes to cut and squeeze the fruit for your own fresh orange juice; it's to die for. What's more, using a sourdough starter, research shows that even those suffering from serious wheat intolerance causing abdominal pain, bloating and blood stools can if they understand the meaning of gluten enjoy bread every day. 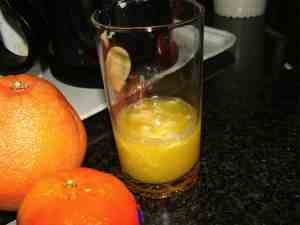 This orange juice facts page outlines the simply vast difference between OJ and the freshly squeezed stuff. Once you're in a routine, these things don't take long; slow food made fast. Give one child the responsibility to make the smoothies, another to slice the mushrooms... teaching them to get back to the foods that granny prepared is probably one of the most important things you can do for them; of course, there'll be some whingeing when crappy cornflakes are no longer on the table. Let them complain. Did you know that white mice fed the box they came in lived longer than those that ate only the cornflakes? Perhaps we'll get onto dinners another day.